Z-Z Estimator (ZZ_Estimator) — Error estimation by Zienkiewicz and Zhu's superconvergent patch recovery. How to measure the size of an error. Type: An object of the ErrorNorm class. Maximum allowable percentage error. Type: A real number in the range [0, 100]. ZZ_Estimator is an ErrorEstimator used when modifying a Mesh by adaptive mesh refinement. It uses the Superconvergent Patch Recovery technique of Zienkiewicz and Zhu. These definitions are nearly useless, however, because the exact solutions and are almost always unknown. It is therefore necessary to invent a way of estimating the error. The error estimate procedure developed by Zienkiewicz and Zhu, employing Superconvergent Patch Recovery has proved to be effective and economical both in evaluating errors and driving adaptive mesh refinement. It is well known that the field derivatives and fluxes computed from the finite element solutions do not possess interelement continuity and have a low accuracy at nodes and element boundaries. However, there are points within elements, known as superconvergent points, at which the derivatives and fluxes are more accurate than at any other point within the element: values at the superconvergent points converge more quickly to the true values as the element size decreases. It is possible to get (or recover) a more accurate value of the stress at a node by interpolating between the stresses at the superconvergent points in a small set of elements (a patch) around the node. The ZZ_Estimator compares the recovered and directly computed values of the given flux and refines those in which the norm of the relative error is greater than the given threshold (given as a percentage). The remainder of this page is not required reading. 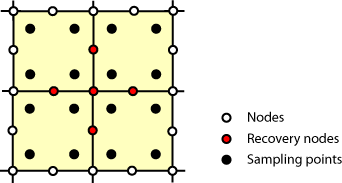 The superconvergent points for various element types are summarized in Table 6.7, where the black dots represent superconvergent points. Figure 6.117 and Figure 6.118 illustrate typical patches. Only the values of nodes that are completely inside the patch are recovered, unless the patch contains boundaries, in which case values at the edge of the patch are recovered too. A Typical patch for the Superconvergent Patch Recovery procedure. A Boundary patch for the Superconvergent Patch Recovery procedure.